View More In Hair Drying Towels. It is crafted from super soft microfiber material, gentle and comfortable feeling, durable to use. Absorbs wetness and dries hair faster than normal towels, use it to dry your hair, especially long hair, fast and easy. Comes with button & loop for keeping it on securely, easy and convenient to use. Large enough, the extend size is 64 x 25 cm/ 25.2 x 9.8 inches, perfect for short or long hair type. Lightweight and portable, convenient to carry, perfect for home use or on travel. HIGH GRADE MATERIAL - It is crafted from super soft microfiber material, gentle and comfortable feeling, durable to use. 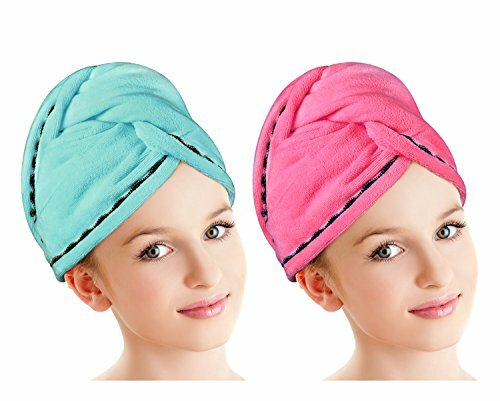 SUPER WATER-ABSORBENT - Absorbs wetness and dries hair faster than normal towels, use it to dry your hair, especially long hair, fast and easy. EASY TO USE - Comes with button & loop for keeping it on securely, easy and convenient to use. ONE SIZE FITS ALL - Large enough, the extend size is 64 x 25 cm/ 25.2 x 9.8 inches, perfect for short or long hair type. COMPACT AND PORTABLE - Lightweight and portable, convenient to carry, perfect for home use or on travel. If you have any questions about this product by Luxspire, contact us by completing and submitting the form below. If you are looking for a specif part number, please include it with your message.